In this tutorial we’ll see how to stop the Autoplay function on a Bootstrap carousel. If you’ve used this component of the Bootstrap framework before, you probably know that by default it cycles through elements automatically as soon as the page is loaded. This is a nice feature to have, but in certain situations you might not want it. Instead, you might need a static carousel that stops “on page load” or one that stops and starts based on various events that happen on the page, like for example when the user scrolls down the page, clicks on a button or link, etc. Here we’ll see 3 examples beginning with a simple carousel with no autoplay and then using buttons for pausing and starting the auto slide again. For this tutorial we’ll use one of these carousel templates (template 3) as an example. At the end you can download all the example templates. Let’s begin! To remove the autoplay entirely and have a simple carousel that doesn’t cycle, you can do it in two ways. 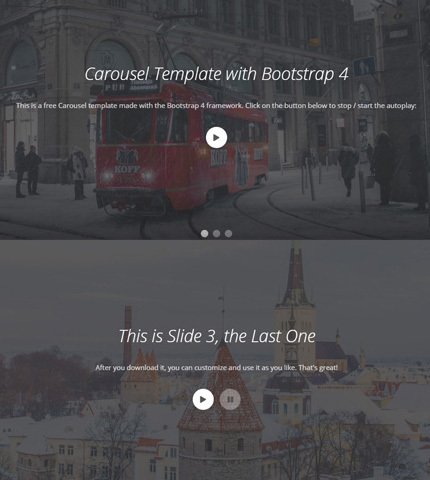 This is a free Carousel template made with the Bootstrap 4 framework. Check it out now. Download it, customize and use it as you like! You can download this free template on <a href="https://azmind.com" target="_blank">AZMIND</a>. After you download it, you can customize and use it as you like. That's great! The HTML code is very simple. Now, the first way to stop the autoplay is by just removing the attribute data-ride=”carousel” from the code above. The carousel component comes with some other methods that you can see in the documentation here. The carousels in these examples use also some CSS for styling. I’m not showing the code here to keep the tutorial short, but you can find it in the files “style.css” and “media-queries.css” (in the folder “assets/css”). You can see a PREVIEW of this example HERE. Here is the HTML code I’ve added to the carousel for the button (file “index.html”). I’m not showing all the carousel’s code here, just one slide. I’ve added the button’s code to all the slides. To style the button I use some CSS code, as usual, in the file “style.css”. So, download the examples above, play with them, make your own experiments and if you have any question or suggestion, let me know in the comments below.